Luke Skywalker sits on his crashed starship on Dagobah. Paper art print inspired by the Star Wars film The Empire Strikes Back. Limited edition of only 95 hand-numbered pieces, each signed by artist Peter Ferk! Are you sure you want to know what's down there? 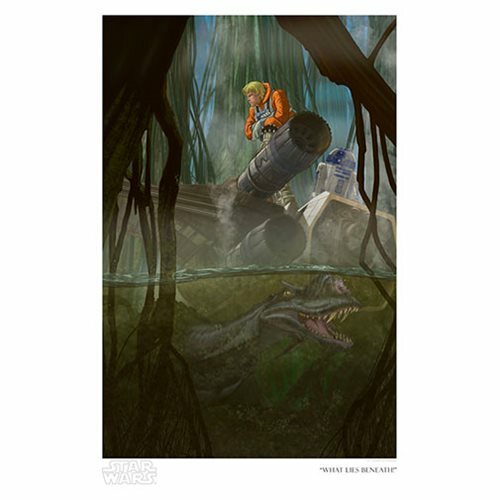 Luke sits pensively on his crashed starship on Dagobah while danger lurks below in this engaging Star Wars What Lies Beneath by Peter Ferk Paper Giclee Art Print. Based on theStar Wars film The Empire Strikes Back, it's an unframed limited edition of just 95 pieces - each signed by artist Peter Ferk - that includes a certificate of authenticity. The print measures 19-inches tall x 13-inches wide, with an image size of 17-inches tall x 11 3/10-inches wide.